Is John McCain trying to be the older, whiter, more conservative Barack Obama? On Tuesday, the Senator co-opted the slogan that has come to personify Obama's candidacy, taking the Illinois Democrat's "Change You Can Believe In" and altering it into "A Leader You Can Believe In." Now there is this. 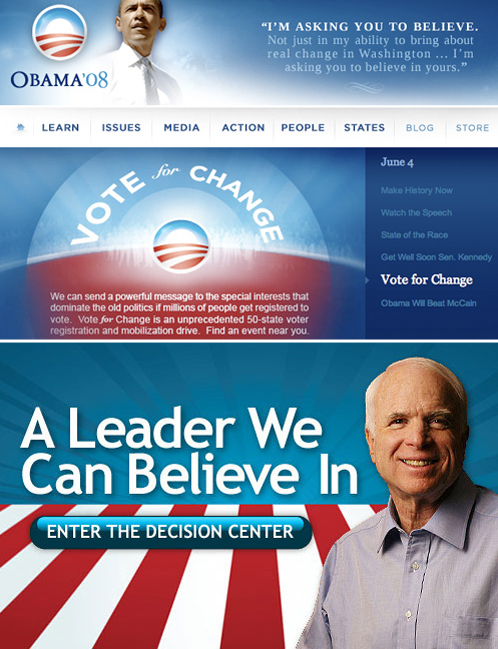 On Wednesday, the McCain campaign put out a new homepage, featuring his new, Obama-like slogan, and an image that seems uncannily similar to Obama's trademark campaign logo - the red and white stripped valley under what appears to be a blue sun (or in McCain's case, blue sun rays). Take a look. McCain's seems to be positioning himself so that he is not caught, like Sen Hillary Clinton, simply ceding the mantle of change to Obama. But when the co-opting of images, logos, and slogans is this blatant, it could prove more embarrassing than advantageous.